This reeks of oak, too much especially at 6 years of age. Each sniff and swirl brings to mind mahogany furniture. Fair degree of gylercol weight, acid and alcohol offsett by sweet ripe fruit. Interesting but not the light fine complex wine I would expect for Musigny. My previous reviews of this wine gave been so much more flattering, I even wrote that “the oak is completely in the background”. Either there is bottle variation, or it’s the fact that I’m getting over a cold, or that my palete is improving (or all three?). 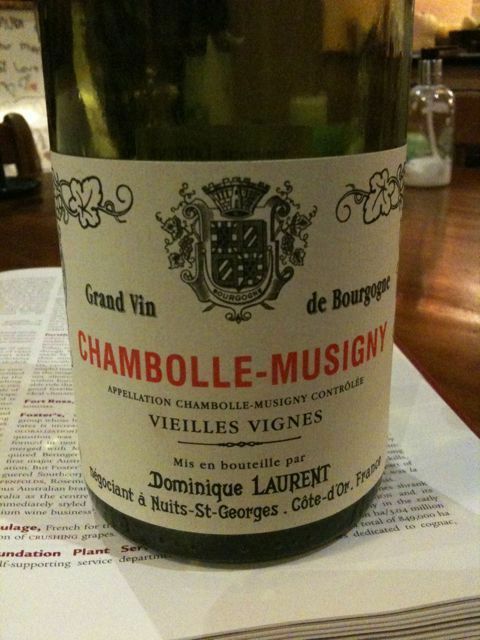 This entry was posted in Burgundy, France, Wine by ByronSharp. Bookmark the permalink. THis has a lots of oak. More like Rioja than Burgundy, but it is still a characterful wine.